The weekly based this estimate on a recent decision by Eurostat requiring Germany to include the balance sheets of public-owned bad banks (NOTE: It is government-owned; or did you vote for any of these nationalizations?) - set up to help financial institutions offload toxic and non-strategic assets - into its overall debt ratio. As Eurostat is the statistical office of the EU it can be expected that all other EU members will have to follow suit, igniting a fresh round of debt growth of government debts. It is permissible to speculate that Eurostat may have sent such a notice to all EU nations. So far, only Germany and Austria had to resort to outright nationalizations. state-owned WestLB AG bank has already offloaded €77 billion into such a rescue bank. Going by the Eurostat decision, €54 billion of WestLB's toxic assets transferred to the bad bank must be included in Germany's overall debt level. Finance ministry spokeswoman, Jeanette Schwamberger, said the "winding-down entity of WestLB has already been included in the government's recently published calculations of the debt level." In July, it forecast Germany's debt level will rise from 73.1% in 2009 to 79% of GDP in 2010, 80% in 2011, to 80.5% respectively in 2012 and 2013 before easing to 80% in 2014. Die Zeit said that if nationalized mortgage lender Hypo Real Estate is added to the equation, Germany's debt level could widen to 90%. However, the impact from Hypo Real Estate is yet unclear because a rescue bank hasn't been set up and it's unknown how big the volume will be, according to Schwamberger. Living in Austria I naturally think first what this will mean for this country (more thoughts on the rest of Europe below) that got wrecked by former chancellor Wolfgang Schüssel under whose "leadership" white-collar crime and corruption has begun to mushroom since 2000. Only today a German paper concluded that nobody gets ever prosecuted as long as he is connected to the government. Austrian observers have been enraged about this for some years. Now the sovereign will be presented with a horrific - and probably un-payable bill. Austria has nationalized scandal-laden Carinthian Hypo Alpe Adria AG last December. The bank recorded a net loss of €1.6 billion in 2009 but still sits on a portfolio of €7.3 billion non-performing loans and another €7 billion in loans on the watchlist while prosecutors are still combing through the bank's files to find out if there may be still more losses in the offing. If these €14 billion end up on the governments tab, the debt/GDP ratio will rise some 7 percentage points to more than 73%. While this may be small fry compared to the big Eurozone countries Eurostat's action may forebode that Austria will have to include the debts of government-owned special entities like debt-laden Austrian railways OeBB and money losing road-builder Asfinag as well. This would drive up Austria's current debt:GDP ratio of 66.5% significantly. This will also deteriorate Greece's position further when I think of Hellenic Postbank TT. 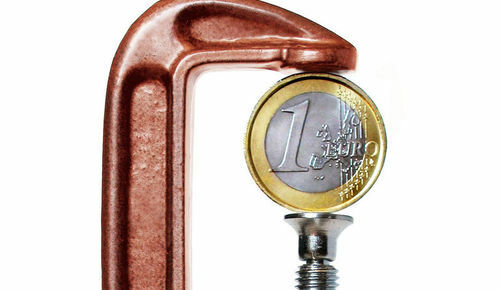 As all major Eurozone countries have long exceeded the Maastricht criterion that stipulates government debt of no more than 60% in relation to GDP, the death of the Euro, an artificial fiat currency with absolutely no backing behind it, is clearly written on the wall. And there is no cure for it. We can rather expect more symptoms of terminal illness to emerge once all EU countries have to come up with an unadulterated account of government net debts. Spain is off the hook for the time being as the problematic Cajas are not formally state-owned - yet. And I guess I will not earn any serious criticism for the claim that spun-out debts will emerge in many more EU countries that will have to be added to government debt again. Parsing the list of Europe's 91 potentially bad banks more losses or accounting irregularities can be realistically expected. Not one of them is in good shape. All this happens almost exactly 3 years after the beginning of the subprime crisis which has by now swollen into the worst Western financial crisis of all times. Don't believe into any politician who says that it was necessary to prop up European banks with EU, ECB or government funds. Banks may be systemically relevant - but certainly not all of them. And this is the core European problem where politicians, scarily eyeing their constitutencies, wanted to save all banks and not let the boom-bust cycle let go its course as is the case in all other industries. There is absolutely no reason why banks should be shielded from their own fallacies. Sad as it is, this crisis will lead to an even sadder reemergence of nationalism in Europe when every country will look for its own best once it finds out that neither the EU nor the ECB has the money to save it and they will have to scramble for funds on reluctant capital markets. The ECB may hold its leading interest rate at 1% or even drive it lower, but this will not prevent a surge in government bond yields because it is clear the risk is actually much higher than reflected by current low yields. Experts have so far overlooked the dichotomy of historically low rates and the real risks one carries by buying government debt. None of them saw the subprime crisis coming either. Never before has there been such a contorted situation that governments pay record-low yields whilst being entangled in the numerically biggest debt crisis in history. It is an irony that of all people it will have been the Eurocrats of Eurostat that will have suicided the Euro when seeing it from a post-event perspective. I, for my part, hope to find some sleep after reading a few more pages of This Time Is Different: Eight Centuries of Financial Folly , wishing that all responsible officials in Europe would read it too. Otherwise we may be doomed because "Experience shows that man never learned anything from experience".